Save Time and Money With Online Booking and Flat Rate Pricing! One of the newest trends today in Phoenix Arizona is green cleaning. Not only is it good for the environment, but it is also fantastic for the health of your home, family, and pets. Green cleaning means that you use products and equipment that are non-toxic, organic, and/or are earth conscious in some way. Using green products and cleaning in an environmentally friendly way is extremely important for your home and family; this is why. Green cleaning products are often made from non-toxic and organic ingredients. With no harsh chemicals and ingredients you can't understand, these products are much healthier for your family. While regular cleaning supplies and products can only be used on certain areas of the home because of harsh chemicals, green products are almost always multi-purpose and can be used on a variety of surfaces. Green products also have no harsh fumes, meaning they are safe to use while children are still in the home, and you do not have to worry about your child harming themselves if they accidentally get into the cleaning cabinet. The green products you use in your kitchen are much healthier than traditional products that might transfer chemicals to the food you prepare and eat, making them better for use in kitchens. Green products also remove three times more particles than traditional cleaners and have no scent, helping those with allergies, asthma, and other breathing/health issues. Cats, dogs, and other small animals are naturally curious and will often sniff around the house and lick surfaces in an act of exploration. This is why green cleaning a home with pets is so important. Chemicals within traditional cleaning products can be harmful and even poisonous to pets, meaning you are putting them at risk every time you clean. With green products, you do not have to worry about this. Made with organic ingredients, most green products are perfectly safe for small animals to lick and sniff without fear of ingesting anything dangerous. The earth that we live on today is being taken advantage of, and green cleaning can help reduce your carbon footprint and protect the earth you live on. Harmful substances in traditional cleaning products can kill vegetation, harm water, and even poison animals. Green products do not have these chemicals, and when they evaporate into the air or are washed down the drain, you know they aren't going to harm the environment in any way. There are plenty of green products that you can make from home, but that does not mean they aren't just as effective as traditional products. For example, you can make an all-purpose cleaner from vinegar and baking soda, while a traditional all-purpose cleaner could be upwards of $8 at the store. Even green products you do not make from home, but buy can be cheaper than traditional cleaners. But, tests have shown that they clean just as well. Indoor air quality is already bad because homes often do not have good circulation and windows are closed for a majority of the year. This means that the air in your house is often stale, old, and traps particles of harmful substances. This is no exception when it comes to cleaning products. Traditional cleaning chemicals can sit in your home's air for days, causing poor air quality and leading to breathing problems. Green cleaners release no toxins or chemicals into the air, keeping your home's air quality just a little bit better. This type of air quality control can be very useful in a home with children or adults who suffer from health issues that center around breathing, such as asthma. Maid Complete offers a variety of different services for house cleaning in Phoenix. What is unique about our company is our dedication to the environment. We supply our own cleaning supplies at every job and all of them are earth conscious. They are made of non-toxic, organic ingredients, perfect for use in any home, especially those with kids and pets. 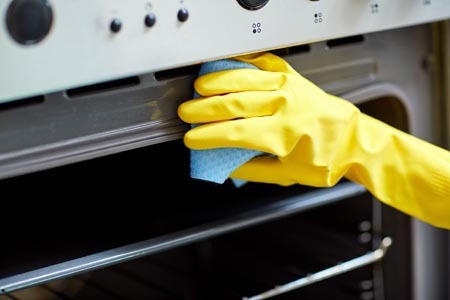 Don't sacrifice your health and safety with traditional products and choose us at Maid Complete to clean your home with safe, non-toxic products. The above reasons are only a few of why you should go with green products and services rather than traditional. Research has shown that green products are healthier and safer to use and they are better for the environment. Treat your house the way it should be treated, and strive to use green products and services. Maid Complete is bringing maid services and home cleaning into the 21st century. Find out more about us and our mission! © 2019 Maid Complete. All Rights Reserved.